John Pope is my husband’s grandfather. Last year Grandpa John, who is a young 84, was very ill and we were worried that we would lose him. Our family was very fortunate that John agreed to surgery and is now back to his active self. During one of our visits last Fall, Grandpa John, husband John, and I were talking about the time Grandpa John spent in Alaska with the Coast Guard. I was so happy to have my Iphone with me. I was able to record the conversation using the voice memo app. 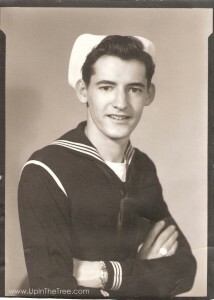 John enlisted in the Coast Guard the day before his 18th birthday in November 1945. He chose to enlist in the Coast Guard to avoid the draft and possibly end up in the Army. One of John’s friends was already in the Coast Guard and worked on the San Francisco Bay. This friend tried to get John assigned to his unit but unfortunately for Grandpa John, he was sent to Alaska instead. Out of boot camp, John boarded a train full of other enlisted me bound for Alaska. The train stopped in Seattle and the men then boarded a ship called the Rolling O. The ship had a round bottom and was constantly rolling even in the calm waters of the inside passage. Most of the men on the ship had never been on the water before and were very ill for the ride. John remembers a dog they picked up in Ketchikan was sliding back and forth across the deck. Out of Ketchikan, the ship began dropping 5 or 6 men off at a time to different Coast Guard stations in the Aleutian Islands. 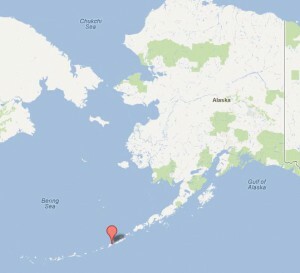 Umnak Island was the final destination for Grandpa John, his buddy, Al Miller, and several other men. Umnak Island had a Loran radio that was monitored by the radiomen 24 hours a day. According to Wikipedia, Umnak Island is the third largest island in the Aleutian Chain at 72 miles long and 16 miles wide. It has a volcano that erupted as recently as 2008. As of 2000, it was inhabited by only 39 people. Grandpa John remembers there being a few dozen people on the island including a rancher that lived nearby. He described the island as desolate. There was a large pond that served as their drinking water. The station was located above the ocean on a cliff. Each day they had to climb even higher to reach the radio station. When the men arrived on the island, none of them had been trained for specialty jobs. The man in charge simply asked who wanted to cook. A man nicknamed Frenchie answered the he enjoyed cooking so he became the chef. Al Miller, mentioned that he like to tinker with cars so he became the mechanic who was in charge of keeping the generators running at all times. Al did not know anything about diesel but learned quickly. Grandpa John did not raise his hand for any of the jobs so he became a scope dover. John had to climb to the Loran radio each day and watch the scope while the engineers who had been trained at Loran school ran the radio. Grandpa John claims that he was not very proficient at watching the scope. John told us about down time on Umank island. There was a pool table and ping pong table but they were rarely used. When not working, the guys would go hiking, fishing, and hunting. There was trout in the tundra streams. When the Salmon would come up the streams, they would be so thick you could walk across the stream. The men enjoyed the freshly caught fish since all of the dry food was brought in by boat and they had no refrigeration. The electricity produced by the generators was focused on keeping the radio running. At the time, the island was teeming with eagles. The rancher who lived nearby hated the eagles because they would attack his sheep. Sometimes the men would check out rifles and try to shoot down eagles. John says that they rarely hit any. Although John had a 3 year enlistment, he only spent about 6 months on Umnak island. His decision to not raise his hand for a job turned out to be a good thing. 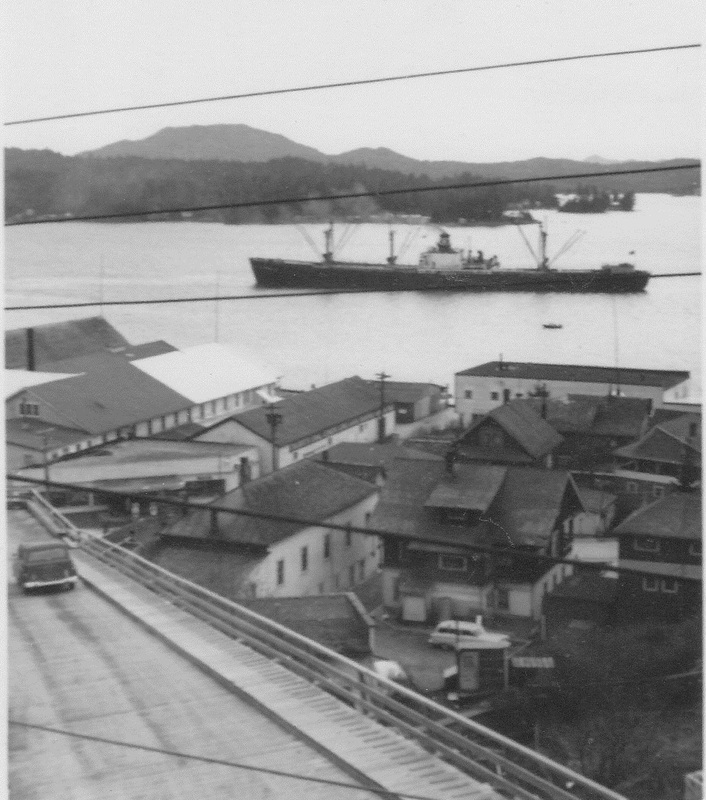 The men with permanent jobs stayed on the island while John was transferred to Ketchikan to finish his enlistment. 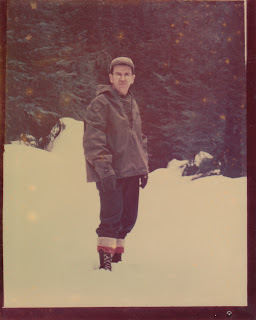 I will tell you more about his time in Ketchikan in another post. Black Sheep Sunday – Where did Frank go after San Quentin? 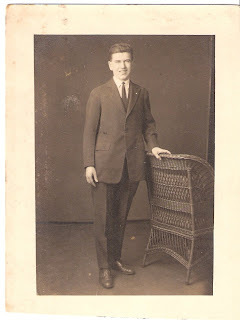 Frank Gingg is my husband’s maternal great grandfather. I have written a previous post about the crime that lead him to spend some quality time in San Quentin (Black Sheep Sunday – My Dad Lived In San Quentin). I have known since a vacation with my husband’s family in 2001 that Frank lived in Alaska. We enjoyed a cruise of the Inside Passage including a stop in Ketchikan. I remember Grandma Shirley pointing out the newspaper office. She told us a story of visiting her dad one summer and coming to the paper where he worked as a printer. What I did not know at the time of the cruise is that Frank had spent at least six years in San Quentin starting in 1933. I have been wondering since my previous research what was Frank’s life like after prison. Last fall I was contacted by a new cousin who had read my original blog post about Frank. This cousin is the son Frank adopted after getting remarried in Alaska. For privacy I will call this person Cousin L. Cousin L has been wonderful sharing information about his memories of Frank and a cd full of photos. The digital files I received included a obituary from the newspaper in Ketchikan. The obituary states that Frank had lived there for 15 years. This puts his approximate date of arrival as 1942. We know that Frank was sentenced to at least 6 years in prison in 1933. It is more likely that he was in San Quentin for 8 or 9 years. I know that Shirley spent at least two summers with Frank after his arrival in Ketchikan. Shirley married in 1947 so I am guessing these summers took place about 1943-1945. After Frank arrived in Ketchikan, Alaska he made contact with a childhood friend named Cecil. Cecil was had two children from a previous marriage. Frank and Cecil were married February 26, 1953 in Alaska. Frank adopted both of Cecil’s children. 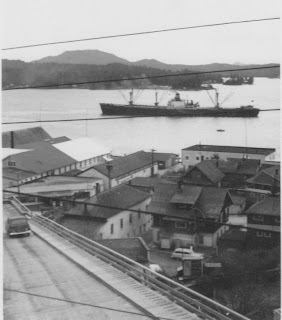 Cecil and the kids moved to Ketchikan where they resided at 1200 Millar Street. Frank, Cecil and the kids enjoyed life in Ketchikan. Frank worked as the mechanical superintendent at the Daily News in Ketchikan. He was in charge of all the printers. The family used to swim in the summers and ice skate in the winters at Ward Lake. Cousin L has many warm memories from this time in Alaska. In October 1957, Frank and Cecil drove to California for a visit with Frank’s family. He would visit his mother, Belle; daughter, Shirley; and sister, Catherine. This would be the first time that Catherine and Frank would see each other in many years. It would also be the last. On the drive back to Alaska, Frank would suffer a deadly heart attack in Weed, California on October 26, 1957. His body was taken back to San Francisco for funeral services. Frank is buried at Cypress Lawn Cemetery in Colma, California. I heard this story for the first time about 3 years ago and was amazed. It was one of those stories that people knew but don’t talk about much. I have since researched the story and found out that it is very important to pick your friends wisely. This is the story of Charles Frank Gingg and his time “living” in San Quentin. Charles Franklin Gingg taken June 1920 Pacific Heights Grammar School. Charles Gingg was born Charles Franklin Padgitt on October 5, 1905 to John A Padgitt and Carrie Belle Wells. His mother divorced his father and remarried William Carl Gingg. Charles took William’s last name after his mother remarried. All family stories have Charles using his middle name. Frank Gingg married Agnes Mattson September 5, 1925. On the marriage certificate, Frank is listed as 22 and Agnes as 19. In reality, Agnes was only 16 at the time. She had lied to get past the age restrictions for marriage. 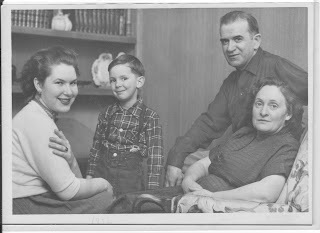 They had one daughter, Shirley Marie Gingg on September 16, 1927. The 1930 census shows the young family living in Santa Rosa, California. At the beginning of 1933, Agnes left Frank and took their young daughter to live in Santa Rosa. Frank was living in an apartment in Santa Rosa with Ralph Thatcher. Apparently, they both worked together as printers in Santa Rosa. On February 20, 1933, Frank met with Andrew Mareck in San Francisco to discuss driving to Santa Rosa to rob a speakeasy in the back of the Buon Gusto Hotel on Adams Street. Frank, along with Tony Cardinelli, F.B. ‘Slim’ Hoyt, Ralph Thatcher, George Jones and Andrew Mareck drove up to Santa Rosa in several cars on February 25 and 26 and met at the apartment of Ralph Thatcher. 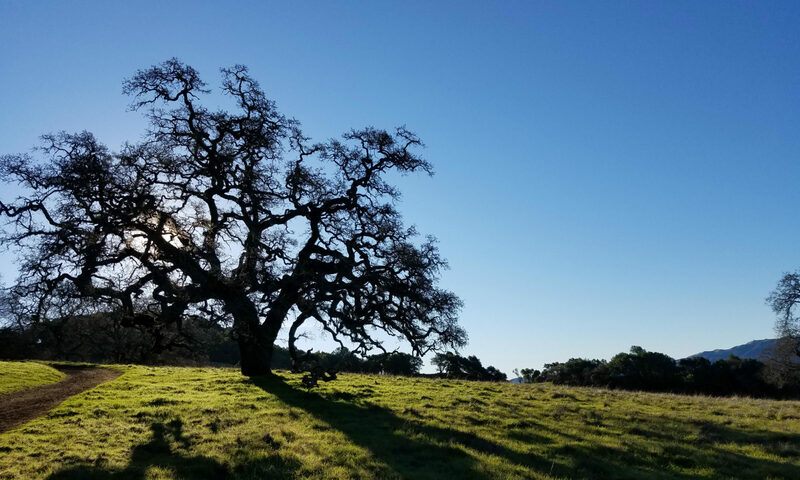 During the early evening of February 27th, the ‘gang’ robbed the 101 Ranch. Frank was not present for this robbery as he was driving up from San Francisco. He met the men at Thatcher’s apartment after. Later in the evening, Andrew Mareck and Frank Gingg went to the speakeasy adjoining the Buon Gusto Hotel for some drinks. They returned to the apartment once again, where they collected their friends and in two cars drove back to Adams Street. Frank Gingg and George Jones remained in the cars as the get-away drivers. Mareck, Cardinelli, and Hoyt entered the speakeasy with guns and declared “stick ’em up.” They stole approximately $17 dollars from the speakeasy patrons and another $100 dollar from the three slot machines in the room. There was a nightwatchman, C.R. ‘Bill’ Carrick, who made regular rounds in the neighborhood. One of the victims of the robbery warned that the nightwatchman would be coming soon. Slim Hoyt went outside to keep watch and ran straight into Carrick in the alley. He shot Carrick six times. Somehow, while being shot, Carrick was able to hit Hoyt once in the arm with his own gun. Meanwhile, George Jones, who was waiting as a get away driver, was spooked by the gunshots and ran back to Thatcher’s apartment. By the time he arrived at the apartment, both cars with the rest of the ‘gang’ had already returned. Thatcher and Mareck, an ‘illegal doctor’ (he was on trial for performing abortions the year prior), tended to Hoyt’s wounds. Gingg, Cardinelli, and Jones all immediately returned to San Francisco. The cars used in the robbery/murder were quickly identified to police who within hours found them parked outside of Thatcher’s apartment. Police took Thatcher and Mareck into custody. Slim Hoyt had escaped and was on the run. After Mareck was interviewed, the Santa Rosa police had the San Francisco police go to his home. At the apartment in San Francisco, the police found Thatcher and Gingg. All men were arrested. Thatcher and Gingg were not immediately transferred to Santa Rosa because the Sheriff had received threats of mob violence. In the days after the murder, the police ordered that all speakeasy’s in Santa Rosa be shut down. Apparently, the was not a drink to be found the following evening. Agnes Gingg and her mother-in-law, Carrie Belle Gingg, visited Frank in jail. Agnes told the local paper “I have all the faith in the world in Frank and I’ll do everything in my power to help him. Frank has never been in any trouble before. I can’t believe that he would do anything like this. He told me when I talked to him that he wasn’t there when the shooting occurred and I believe him. But, I can’t understand how he ever became mixed up with that crowd in the first place.” Apparently, Frank became friends with the ‘gang’ after Agnes left him. I have not found out if and when Slim Hoyt was arrested. I have scanned the papers a month after the robbery/murder and he still had not been captured. All of the ‘gang’ members were convicted of robbery and first degree murder in May 1933. All of the men were sentenced to life and 5 years to life CS (My best guess is that notation means concurrent sentences). 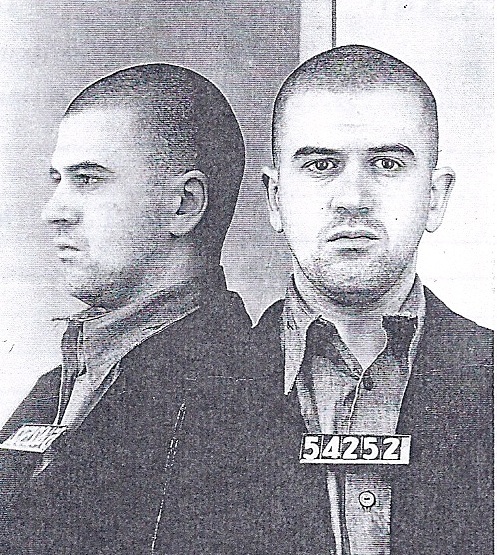 Frank was processed at the intake center at San Quentin on June 2, 1933. Mareck and Jones both tried to appeal their convictions. Both of the appeals were denied. While in prison, Frank received divorce papers from Agnes. I am still trying to find the date that Frank was released from prison. It was not included in the San Quentin prison records I received from the State Archives. When he got out, Frank moved to Alaska. He lived in Ketchikan where he worked at the local paper as a printer. I have been told by my mother-in-law that Shirley only told her sons that their grandfather had been in prison when they started to act up as teenagers. She wanted to make sure that they knew the consequences if they got in trouble with the law.